We spent Sunday at Noah's Great Grandparents house where we had a family meal and a get together. We had a lovely afternoon, great company and fantastic food. 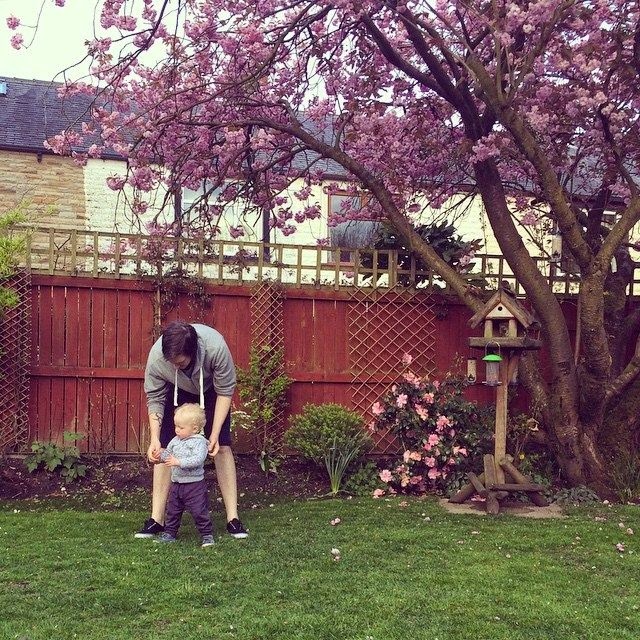 Here is Nick and Noah playing under the blossom tree. 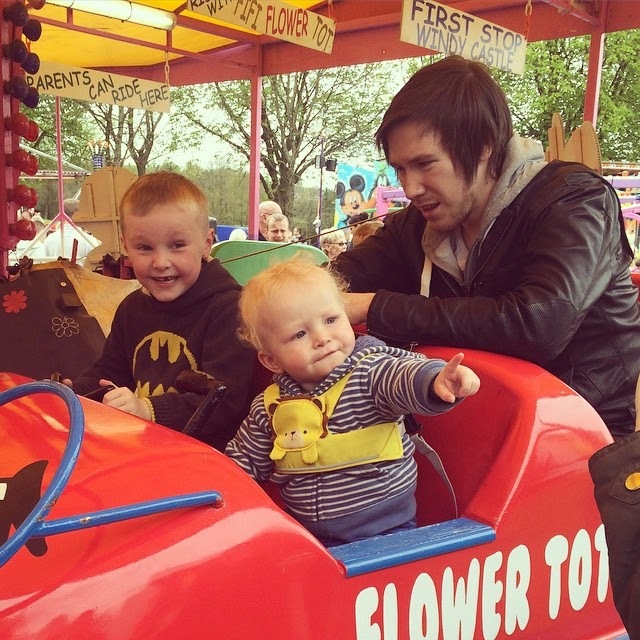 Bank Holiday Monday saw us taking Noah to the fair where he enjoyed his first fairground ride with his cousin Tristan. Can you believe parents still need to pay to go on with their toddlers? Scandalous. Tuesday brought us terrible weather. It was very dull and rained all day. 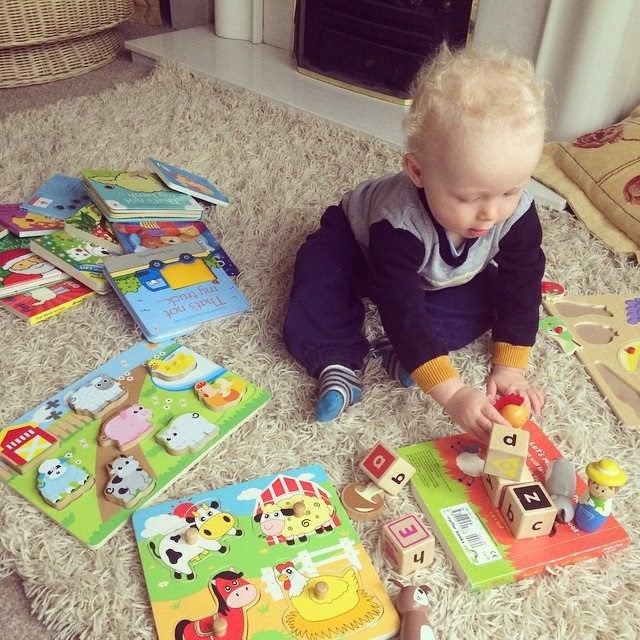 Noah and I made the most of our time together by doing puzzles, building towers and reading books. I'm so fortunate that I get to spend every day with him. I woke up Wednesday morning to this beautiful little face. 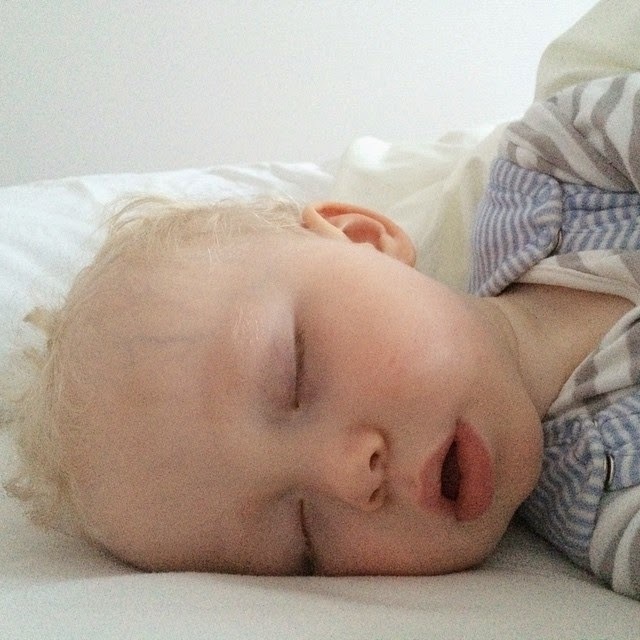 Noah has been struggling sleeping at night because of an advert that has little traumatised him. You know the Yollies advert with the bigfoot in the forest? Ever since he saw that advert he's been scared in his cot at night. Hopefully he will forget about it soon. Thursday evening after our Spaghetti Bolognese we decided to take a stroll around the park before bed. 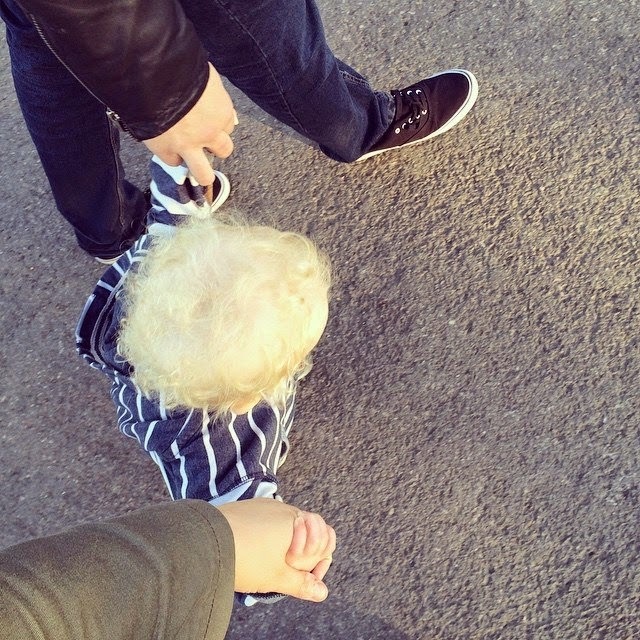 Noah loved holding hands with us both and for me it was a real heart melt moment. 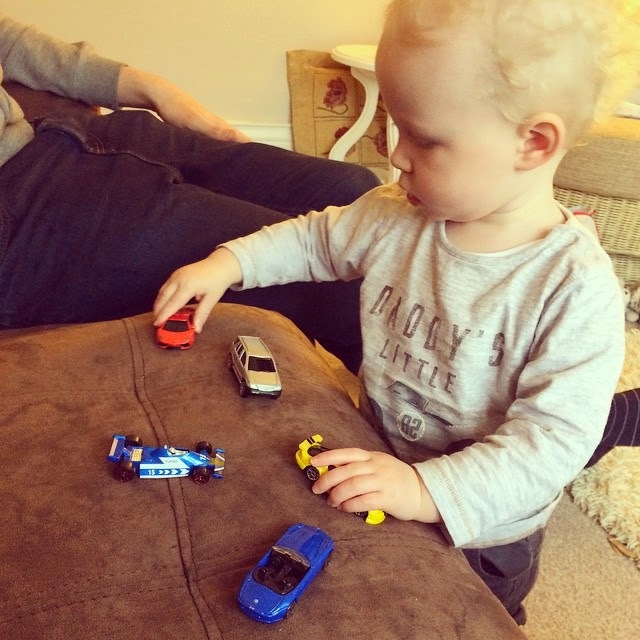 Nick finishes work half day on Fridays and he took Noah out to the shop to buy him some "real cars!" I'm an avid believer that toys are toys. It's not cars for boys and dolls for girls. A toy is a toy and every one is gender neutral. Noah has dolls, toy animals, play foods, blocks, cars and everything in between. It just so happens that he has taken a real liking to cars and trains lately and it's ever so cute seeing him push them around. There are no words for this one. My two loves. What lovely photos! 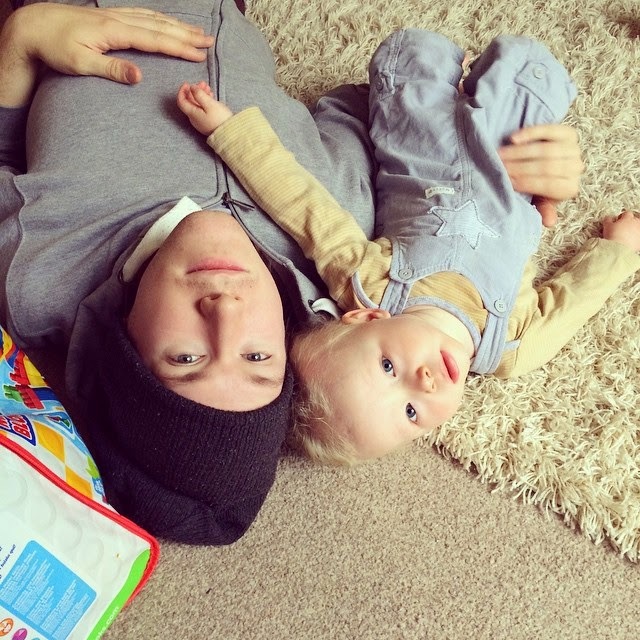 Noah is just adorable!